If you are taking part in a fundraising event and are looking for someone to support please contact us as kellygilbert2008@yahoo.co.uk where we can help with a Puffin Pack including, sponsorship forms, T-Shirt, wrist band and sticker. We have received fantastic feedback from the families who came along to our 3rd annual meet up. Without the support and generosity of the Big Lottery Fund and our fundraisers, this would not be possible. There are now 18 families in the UK who have received a diagnosis of PDH, which means children are being diagnosed earlier, giving them the best opportunity to develop and enjoy as much of life as possible. It’s coming up to the festive time of year and we are asking if you could kindly consider us for any donations, fundraising or shopping you may be doing online. If you are taking part in a fundraising event please contact thefreyafoundation@yahoo.co.uk where we can help with a Puffin Pack including, sponsorship forms, t-shirt, wrist band and sticker. If you are online shopping, please do download the Easyfundraising app (link below). Retailers will then gift aid to us on any purchases you make. It will cost you nothing! Thank you in advance for all your support and generosity. It makes such a huge difference. Please do share this page to your friends and family. With love from all at The Freya Foundation. This weekend was our 3rd Freya Foundation Family meet up. We held it at Alton Towers resort. We had full access to the theme park and splash land water park. Our foundation family has grown significantly, we started off with 10 families and now we have 18. It's lovely to be able to meet everyone and spend time with families who completely understand what each other are going through. A massive thank you to everyone at Alton Towers Hotel they were absolutely fantastic and nothing was too much trouble for the staff. We were fed and watered until we burst, and it all tasted great. A big thank you to the Big lottery fund who helped fund this meet up. A extra special thank you to all our fundraisers and supporters because without you these weekends simple wouldn't happen. And finally a Massive thank you to all the families to who travelled from all over the country to join us for our meet up, I really enjoyed meeting you all and looking forward to next time. This year which is our 3rd meet up we have been very fortunate and the lovely people at the big lottery fund have given us a grant towards this years meet up. This is fantastic news and we are extremely grateful. The difference the meet ups make to the families, the support and information shared is vital. This year with we are off to Alton towers theme park and resort which everyone is very excited about. The big lottery fund help lots of different causes and charities every year and they really do make a massive difference to hundreds of people every year. We would like to say a massive thank you to all our fundraisers and the people at the big lottery fund because without you these weekends simple wouldn't happen. I have some recent fundraising news, Louise Greenhouse and Friends held a Bingo and Raffle night at Withington village hall in Hereford on march 17th. Drinks and homemade cakes were also sold, a very successful and fun night with a total of £625. Also Louise's husband Andy and Friends topped up donations by selling/buying Freya foundation wristbands at a motorcycle track day. So the grand total is £765! I would like to thank everyone involved and a special thanks to Louise and Andy for their support over the last few years. This weekend the National Hill climb association held their annual AGM and Awards Dinner. Like the past few years they held a raffle in aid of the Freya foundation. Club members donated many prizes (mostly booze) and brought hundreds of tickets on the night. Sadly because I was still poorly sick after my MRI scan I couldn't go. Daddy had brought this huge bear as a raffle prize, but instead gifted it to me and brought another prize! A Huge £255 was raised on the night, thanks to Tigger and Hedgehog for organising it! Well done to all the award winners, the new national champion Tommy Hodges. Our very own Team puffin rider Mick Lovelock won the 350cc Class, and dedicated his win to a popular club member who sadly lost his life last month. Paul Tilley won the 350cc championship in 2015, Paul and his family have been big supporters of the Freya foundation. Thanks to all at the nhca, and all that have Freya foundation stickers on their bikes! If you are interested in motorcycles or hill climbs why not pop along to your local track to see them in action. Check out www.nhca.co.uk for 2017 events. They raised a massive £4000. Thank you so much to everyone that supported and sponsored them. A special thanks to my uncle will he's the one in the mud wet and cold. Do you remember a few weeks ago my daddy's bike with my seat on it was stolen from our home. After a massive 65,000 views of my Facebook post, plus the BBC Bristol radio and the Bristol Evening post coverage we had hoped the bike might be found, but sadly not. Thanks to everyone for the support and offers of help. Good news the bike and seat have both been replaced. Chris Child store director at the Clifton Specsavers branch saw the original story and wanted to help, he contacted 10 other Bristol stores to see if they could help and replace the bike and seat. We took delivery of the new bike and seat last week and went to thank Chris in person at the Bedminster branch, daddy and I rode the bike to the store for a test ride and beat mummy and my brother in the car! Since the burglary Daddy has upped the security of our garage and house, the new bike is now under lock and key, in a fully alarmed garage, with security lights, intruder spikes and a cctv system. I can't thank the staff at the Bristol Specsavers stores enough and The Bristol Evening post who covered this story last Wednesday 21st sept too. 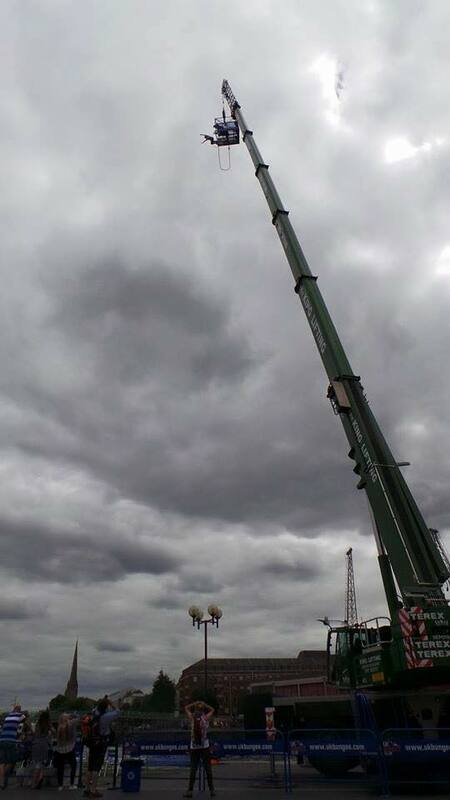 Hannah Mills wanted to do something different to raise awareness and funds for the foundation, jumping 160ft from a crane with some elastic bands round your ankles seemed like a great idea. The jump took place at millennium square in Bristol Harbour, Hannah's family and friends showed up for support. Hannah's target was to raise £500 and I'm pleased to announce its way over that. Well done to Hannah and thank you to all who sponsored her. She's now looking for another challenge so watch this space!